Performing lateral patient transfers is a common task in the daily tasks of Canadian healthcare workers. Although somewhat routine and performed in high quantities, transferring patients from one surface to another can become complicated and cause potential injuries to the staff and the patient. 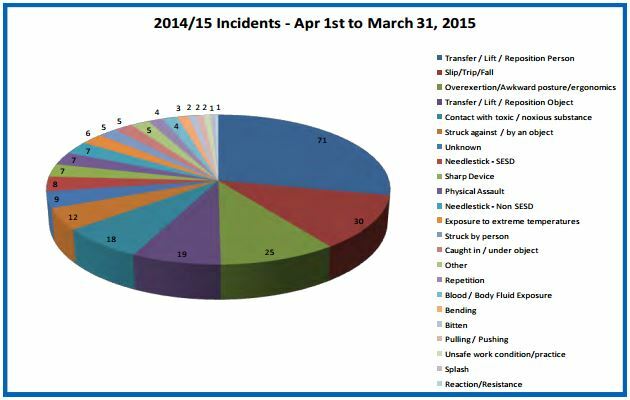 Sunrise Health region in Saskatchewan put together an injury incident report to showcase the importance of proper patient transfers. See the image below. With an array of lateral patient transfer devices on the market, it’s not always a clear decision as to which will be the best fit for you and your facility. 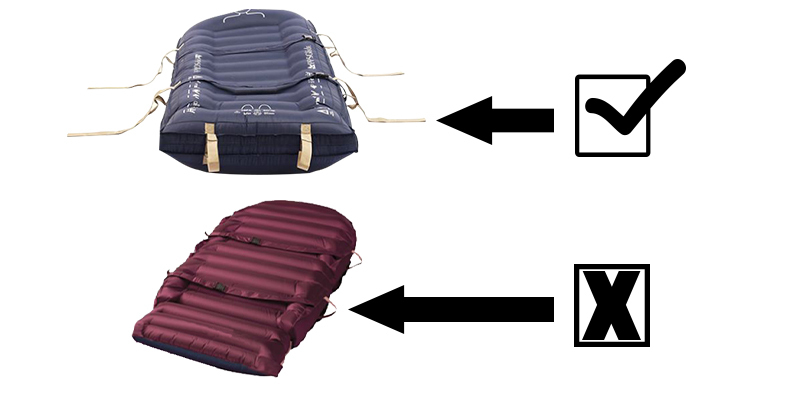 One of the more prominent transfer devices is the air-assisted mattress. The benefits of air assist technology have been well documented and proven. Through our research and interactions with hospital staff, we have come up with the ten most common questions about air lateral transfer systems. Q: How exactly does the air assist system work? A: The mattress has many perforated holes in the bottom where air is pushed out once the air blower unit is activated. The force of the air through these tiny holes reduces the friction between the mattress and the surface. The mattress can then be transferred easier as there is low friction. Think of the whole air lateral transfer system as a hovercraft or air hockey table, where a thin layer of air is created between the two surfaces to allow mobility. Q: Is the patient’s weight compensated in any way? A: Yes. In addition to reducing the friction between the surface and the mattress, the amount of air the mattress holds is directly related to how much the patient’s transfer weight is reduced in relation to the patient’s actual weight. In some cases, the patient’s transfer weight can be as low as 10% of the actual weight. As an example, laterally transferring a 300 lb. patient would have the push and pull forces of transferring a 30 lb. patient. The more air the mattress holds, the lighter the patient will be to move. Q: Are air-assisted patient transfer devices safe for patient handling? A: Friction-reducing devices, such as the Stryker Glide, contain safety features that minimize the risk of injury to the patient and staff. Safety features that should be included are safety straps to secure the patient, thermal insulation and protection, a protective cover for the mattress, and a machine washable mattress so that hospital acquired infections are kept to a minimum. The mattress should also be water resistant and non-latex. One other important feature is that the mattress inflates around the perimeter first before inflating the middle. This will create a cradle for the patient and reduce the risk of tipping. Q: What happens if we use too much push/pull force and the patient slides further than we wanted? A: While most air mattresses should come with pull handles, you should really consider mattresses that come with extended pull handles. The extension allows the patient to be transferred with the outside side rails in the up position. If there is any over exertion, the patient will stop at the siderail. Not only is this safer for the patient, as they will not fall off the surface, but it also means that staff do not have to use their own bodies to stop the patient. 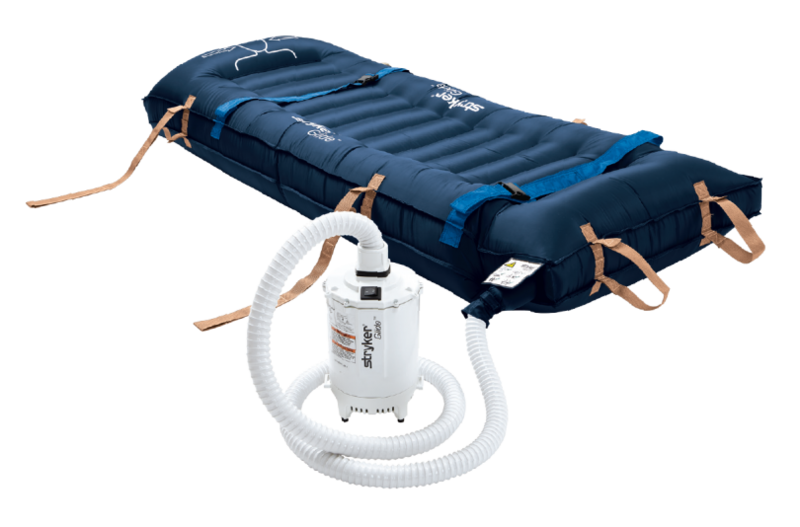 Q: How easy, or difficult, is it to transport an air-assist transfer system that includes an air mattress, hose and air blower? A: When looking at buying an air transfer system, keep in mind how easy it will be to move from room to room, and how easy it is to store. Some transport units require that everything is unloaded before use, whereas others allow you to leave the air blower unit in place. This is beneficial in reducing noise from the blower unit. Whichever option you choose, make sure that the transport has wheels. The weight of some blowers can be as much as 20 lbs., so keep in mind that there is also the weight of the mattress, hose and protective cover to consider. For example, some wheeled transport options include bulky, two-handed carts, while the Stryker Glide comes with an ergonomic tote with a one-hand pull out handle. Q: Where is the best place to put the air blower while in action? A: This depends on the manufacturer’s design. Some air blowers are designed solely to be placed on the floor. This will not give you a lot of flexibility in positioning. Plus, having the air blower on the floor may cause a tripping hazard. At the very least, the air blower should have the ability to be hung off the bed, stretcher or table. 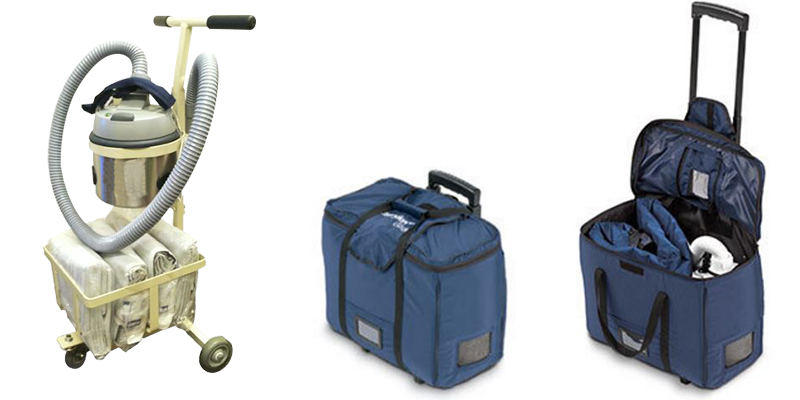 The ideal solution is to have an air blower unit that can stay in its storage and transport roller tote. Not only does it eliminate the tripping hazard, but it also saves time for setting up and reduces the noise when blowing up the mattress. Q: How do I get my ROI from an air-assisted friction-reducing device as opposed to other non-air low friction sliding aids? A: Frist and foremost are the savings you will achieve from reducing workplace injuries. Back injuries to nurses and other hospital staff involved in lateral patient transfers are considered one of the most common workplace injuries. Even though they are common, and we often do not put much emphasis on them, back injuries cost the facility significant money and loss of time. Another great advantage is that you will need less staff to perform a patient transfer. While most non-air sliding aids require, on average, minimum three hospital staff to perform the transfer, air-assisted devices, on average, require only two. This translates into being able to delegate staff to other areas or to perform other tasks. Q: Does an air-assisted transfer system take longer to complete the whole process as opposed to a non-air assist system? A: The answer is yes and no. Yes, it may take a minute or two longer to setup the equipment, but the actual transfer takes less time. In addition, with an air-assisted system, there is less chance of something going wrong. Using non-air systems may take several tries to get the patient completely to the second surface. Q: Can I have imaging performed when the patient is on the mattress? A: Most air transfer mattresses are radiolucent and are safe for imaging and x-ray procedures. Be sure to confirm when inquiring about the product. Q: What are some of the air-powered lateral transfer systems available in Canada? 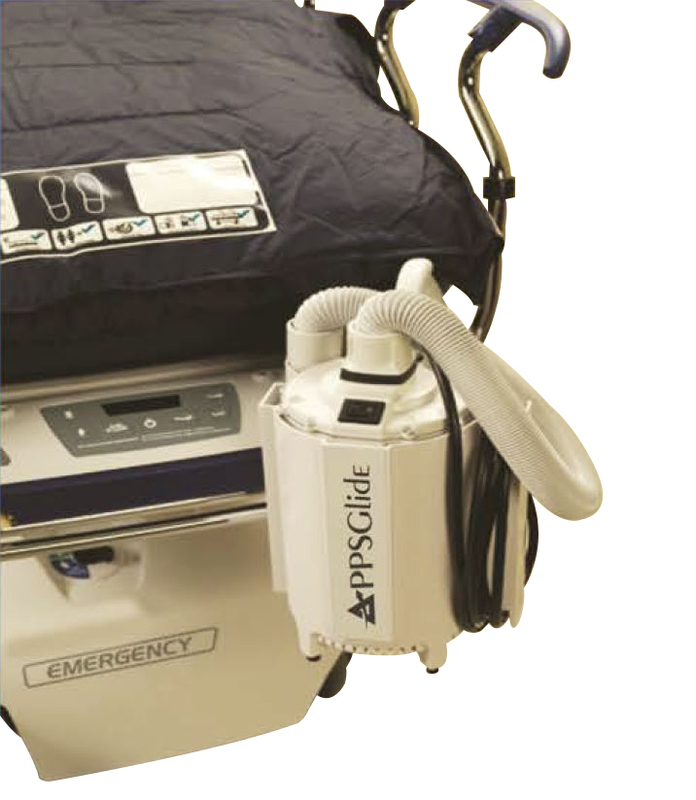 A: Stryker Glide®, Maxi Air®, Hovermatt®, SW Air Transfer™, Air Slide®, AirPal®, EZ Matt®, Liftaem®, ATM-Airpod®, RC Care Glyde®, and FLEXISLIDE®. Have a question you don’t see here? Fill out the form below.